There were two records of this county rarity in this Atlas period, both from the Dee saltmarsh (SJ27X). Colin Wells found one on 15 January 2006, and flushed two during the WeBS count on 19 November 2006. Although a fairly frequent winter visitor to the east coast of England from their breeding grounds in the arctic tundra, the species was ‘quite unknown’ in Cheshire and Wirral in the 19th century (Coward & Oldham 1900). Its first identification in the county in October 1956 led to a flurry of records, some in winter including three at Hoylake, November to 3 December 1956, and others at various Dee estuary localities, some outside the county, autumn 1959 to February 1960 (Bell 1962). There were annual records from 1962 to 1966, mostly at Dee sites but also Walton, Warrington, and up to eight birds on Frodsham Marsh (Bell 1967). 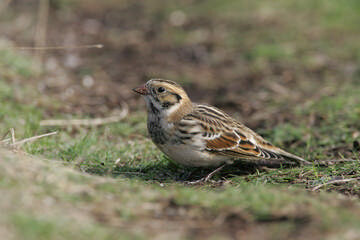 Many Lapland Buntings are first located by their distinctive flight call. Most are recorded on autumn passage, often late into November, with fewer in spring. Wintering birds have been recorded roughly annually through the 1980s and the 1990s, usually from the Dee, where they evidently find plenty of seeds to eat. Most records are of one or two birds although a notable exception was the flock of 20 on the Dee 14 November 1990, reducing to three by 30 December. According to the annual bird reports, in recent years records have been sparse, with one on 13 February 2001 the last before those in this Atlas.